There's a countdown clock on the Garden Show Ireland website which, like the weather forecast, must give my sister palpitations every time she sees it - not that she has time for details like the weather. 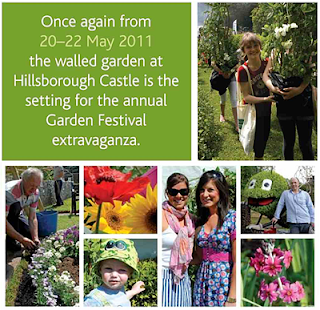 Hillsborough Garden Festival opens this Friday, 20th May, and Claire is responsible for, well, everything except the weather and the inexorable passage of time. I was going to say, 'fingers crossed', but she has a way of leaving very little to chance and I'm sure that regardless of the weather, all three million seven hundred thousand details will come together on the day, and the festival will be better than ever. Lynn is helping with the set-up on Thursday, and I'll be there on Saturday and Sunday with mum, enjoying the fruits of both their labours.